Spaghetti alla Nerano was invented in the fifties by a woman called Maria Grazia in a restaurant bearing her name in Nerano a small town on the Sorrento peninsula. Apparently the restaurant still exists and is being run by her grandchildren! Many Italian pasta recipes are very simple and easy to make, especially those made with vegetables like this spaghetti alla Nerano. Italians love pasta with vegetables. I think there are two reasons for this. Firstly, pasta is traditionally, and often, served as a first course (Italians say primo). This means it comes between the antipasti and the main course (secondo). Consequently, it needs to be kept light. Secondly, Italy has a warm climate with long hot summers throughout the peninsula, but especially in the south. Heavy meals are difficult to digest in the heat, so Italian eat a lot of meatless pasta dishes. 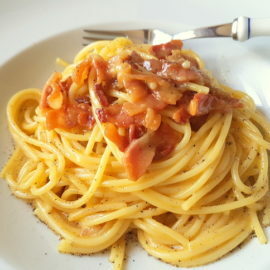 Of course, there are also many pasta recipes which include meat. However, these are either eaten more in the winter or on special occasions or when preparing pasta as a main course. Fresh, seasonal and locally grown. Vegetable based pasta dishes may be simple to make and more easily digested but that doesn’t mean they aren’t flavourful. Italians have a talent for creating tasty food with only a few ingredients. The vegetables they use are almost always fresh, seasonal and locally grown. They make good use of herbs, garlic and, on occasion, peperoncino (chili pepper). Cheese is nearly always present in vegetable based recipes. Italians only don’t use cheese with seafood pasta. 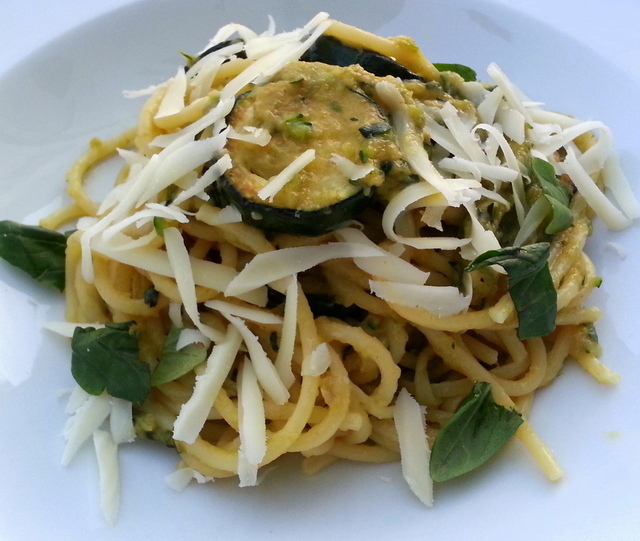 This recipe for spaghetti with fried zucchini (spaghetti alla Nerano) is an excellent example of a simple but exquisite vegetable pasta recipe. It comes from Campania and includes ingredients typical of Neapolitan cuisine. A little alla Nerano history. Like many pasta recipes, there are various stories behind the origins of spaghetti alla Nerano. But, the most widely believed is that this recipe was invented in the fifties by a woman called Maria Grazia in a restaurant bearing her name in Nerano a small town on the Sorrento peninsula. Apparently, the restaurant still exists and is being run by her grandchildren! 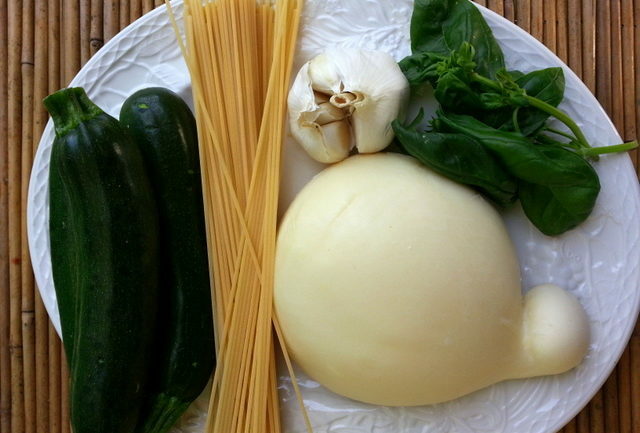 The secret of the goodness of this spaghetti with fried zucchini recipe lies in its amazing and appetizing creamy texture and the unique taste of the particular provolone cheese used. Provolone del Monaco is a semi-hard cow’s milk cheese from the Monti Lattari area which can be quite spicy depending on the maturation. Although provolone del Monaco isn’t available everywhere, there are other spicy provolone cheeses produced in Northern Italy and even in America which can be used instead. The secret to a great spaghetti alla Nerano. The other secret to this dish is that the fried zucchini slices have to be dipped in boiling water before creaming them so that they reabsorb some of the liquid they have lost during the frying. You only need to cream 1/3 of the zucchini slices. The rest are left whole. As I said before this is a very simple but tasty vegetable pasta recipe. I’m sure that once you have tried it you will come back to it time and again. 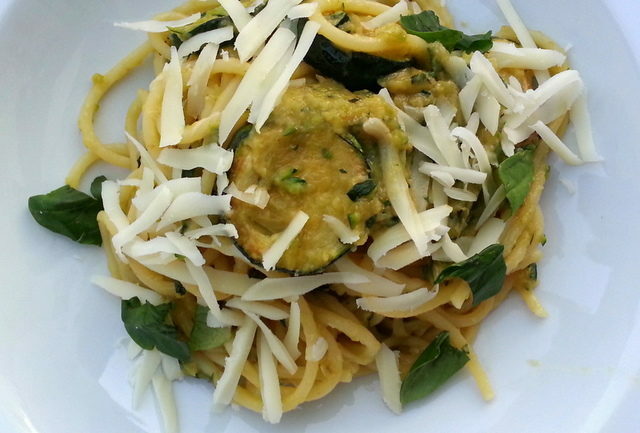 If you do try this spaghetti alla Nerano recipe, I’d love to hear what you think. Please write a comment here on the blog or post a comment on the Pasta Project Facebook page. N.B. This recipe was originally published in 2017 but has been updated. An excellent example of a simple but exquisite vegetable pasta recipe that comes from Campania and includes ingredients typical of Neapolitan cuisine. 1 handful fresh basil leaves. 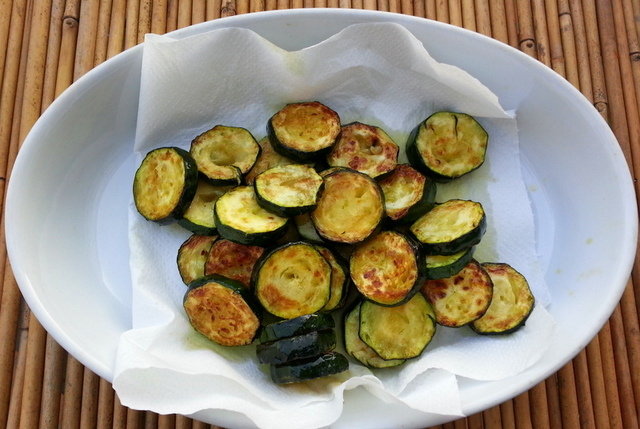 Wash and cut the zucchini into thin slices, then fry them in extra virgin olive oil until browned. Once fried, put the slices on paper towels to remove the excess oil. Meanwhile boil the pasta in plenty of lightly salted water until al dente and drain, keeping aside a glass of the cooking water. Heat some more olive oil in a frying pan with the 2 garlic cloves and cook taking care not to burn the garlic. Dip the zucchini slices in boiling water for 4 or 5 seconds, then cream 1/3 of them either by mashing through a sieve or briefly liquidizing in a food blender. Remove the garlic and add the cream of zucchini and the zucchini slices to the pan and then stir in the cooked spaghetti. If the dish appears too dry add some of the saved pasta cooking water. Continue to stir over a low heat for a minute. Remove the pan from the heat, stir in the grated provolone and season with a sprinkling of pepper and salt, Serve decorated with the basil leaves cut into pieces and some extra grated provolone to taste. Spaghetti is the traditional pasta for this recipe but other long pasta such as linguine work well too. Although the original recipe calls for Provolone del Monaco, this cheese isn’t available everywhere, However there are other spicy provolone cheeses produced in Northern Italy and even in America which can be used instead. This looks like a delicious, healthier pasta dish. Personally I love zucchini so much that it’s just perfect in this dish! Yummy! This sounds so tasty yet simple as well. Very summery flavors. That sounds delicious, I love fresh and simple pasta dishes like this… I don’t think I have ever tried provolone cheese, I’ll have to keep my eyes peeled next time I am in the big city. 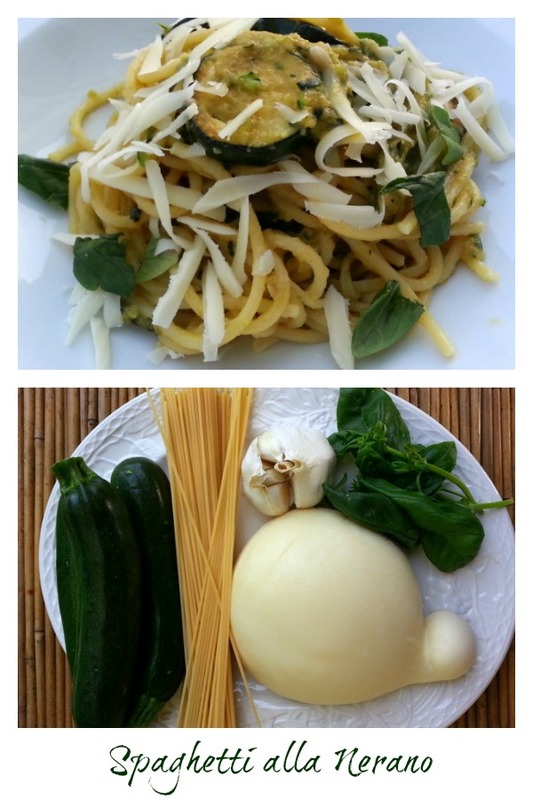 I love how fresh and easy is this recipe, zucchini and pasta pair so well, can’t wait to make it! 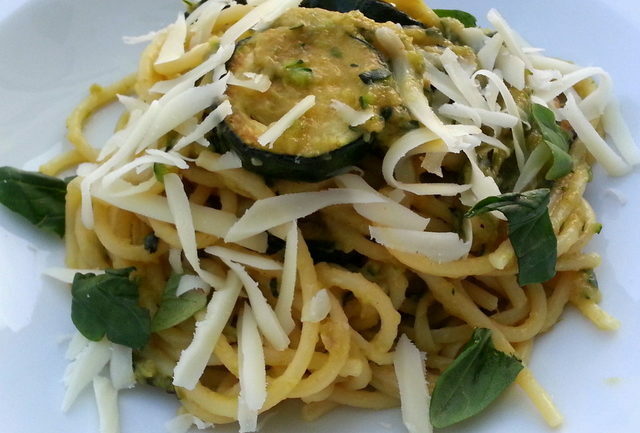 pasta with fried zucchini sounds so simple and delish!! Alla nerona history is interesting. I love fried zucchini so this sounds like a wonderful dish especially combined with that cheese!. This sounds amazing! 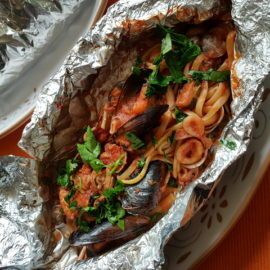 I love pasta and especially dishes like this that are so flavorful and not loaded with sauce. What a great history of this pasta. Can’t wait to try it. Love that the zucchini is a part of the sauce as well as left whole. Yum! Going to save this recipe for summer. So simple and surely delicious! What a delicious and simple pasta dish! Pasta and fresh vegetables is the best combo. I really enjoyed reading the origins of spaghetti alla Nerano. Thank you for sharing. Love the zucchini in the pasta looks so yummy!